← She May Be Over 40, But She’s STILL MY BABY ! ! Here we are at the deadline for Mojo Monday’s Challenge (mojomonday.blogspot.com) once again. And I missed The Shabby Tea Room Challenge which provided the color scheme. Last week’s plan to have my card ready early in the week was pushed aside by the finishing of my daughter’s birthday gift. And all for naught… she hasn’t been feeling well so we will be getting together next week for our family do. The best laid plans….. I got two little 6 inch x 6 inch paper pads at TJ-Maxx, of all places. I had to call my sister in Greenville, SC to tell her to run over to her local store and see if they had any of these because they were very inexpensive. I am usually more of a pastel kind of gal but these included a couple of my favorite brights: apple green and turquoise. The papers are Lime Twist by My Mind’s Eye (a really good brand). The only other paper I used was some Bazzill solid color card stock. I also used my new Tim Holtz markers to trace around several of my pieces to give a stitched effect and some foam dimensionals to raise up the circles and button. I used my Spellbinders Die for the circles and a Sizzix Die for the paper button under the real one which was from the $1.00 bin at Michael’s. I also used some light-colored twine for my bow. I hope you enjoy this bit of bright cheeriness!! Let me hear from you… Blessings & Hugs! 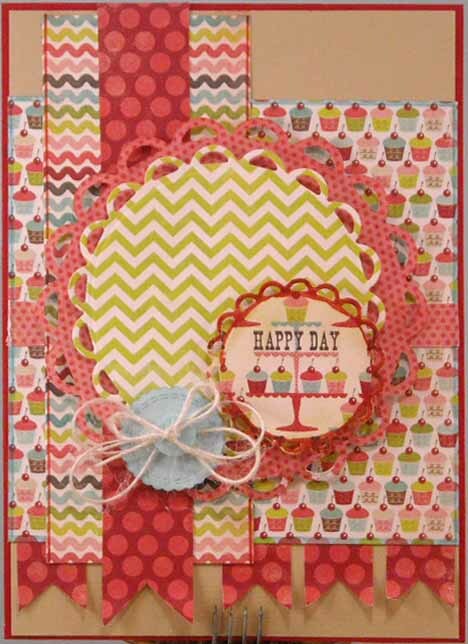 This entry was posted in art, card, papercraft and tagged bright summer colors, button, chevron stripes, cupcake, Happy Day, twine. Bookmark the permalink.